Attempting to complete a paper without first having formulated a good thesis statementa sense of direction or purposemakes the entire researching and writing process more difficult. Regardless of whether you're ahead of schedule or leaving everything to the last minute, a strong thesis statement will set the tone and help guide you through your document. A thesis statement is your chance to take a unique angle on the given material and shine throughout the paper. Introduce readers to your original interpretation of the material and challenge them to consider a new viewpoint. When you put forth your best effort into crafting a truly fascinating observation or argument, you'll discover your groove and the words will start to flow onto the page. Therefore, in times of paper-writing stress, it's important to take a deep breath and brainstorm thesis ideas first. Your thesis statement does need to reflect your confidence about the material, so gather up all your class notes and highlight any key points that inspire you to think deeper about the material. If your class notes leave something to be desired, you can always surf the web and read through other academic interpretations of the material or consider helpful reference guides. As you read through every available resource, you'll feel those brain gears turning and those bright ideas will quickly appear. However, don't lose track of a single thought and jot down everything that comes to mind! Brainstorming sessions can do a serious number on a piece of paper, and you may end up with thought bubbles, triangles, squares, and cats all over your page. However, brainstorming is a fantastic way to challenge your mind and tap into those interesting points that'll make a thesis statement shine. With all these great ideas in hand, you can start to build a strong line of argument that's strengthened by specific evidence in the material. When piecing together your thesis, remember to keep the paper's instructions in mind and stay within any set perimeters. While you might have crafted an amazing thesis, it won't bode well if it's not aligned with your instructor's specific criteria. For example, your instructor may want you to connect the thesis statement to the relevance of civil rights, fashion or economics. It's also important to understand whether you're expected to persuade readers your argument against another established argument; however, your thesis may be required to highlight an interesting connection in the material and not argue against another specific argument. Thinking critically about arguments that can refute your point will definitely help you as well; you don't want to find yourself simply summarizing material and not inspiring some kind of disagreement. Your awesome thesis statement should generally appear in the introduction of your document, so you should strategically place it to generate the most impact. To be on the safe side, consider placing your thesis sentence in the middle or end of the paragraph, and write a couple lead-in statements to gear up to that impact. A reader must be engaged from the very beginning, and your thesis statement will shine that much more when proceeding sentences are strong, informative, and fascinating! Not only is a thesis statement a road map for your reader, it's also your own personal guide during the writing process. It's easy to go off on a tangent while passionately writing about the material, but your thesis statement will wrangle you in and keep you focused on the objective. The body paragraphs are there to provide strong evidence for your thesis, while the conclusion exists to wrap everything up and pack a final punch to drive your thesis home! Regardless of whether you're arguing against an already established argument or persuading the validity of an observation, the power of your thesis will be determined by its impact on the reader. As your document builds, the power of your idea should be strengthened with each body paragraph that introduces more evidence. It's absolutely crucial to interpret that evidence accurately and choose the strongest examples available. While a reader may not even agree with your angle, you can still convince them that your point serves a place and deserves consideration. Surprisingly, you may find yourself successfully challenging a reader and forcing them cave to your astounding and provocative argument. Generating that type of response is a fantastic feeling, and it'll provide you with a surge of confidence that you can apply toward your next paper. The thesis statement of your document is the single most important element of your document. This is because the thesis statement is the one sentence that the entire paper will revolve around. As such, all subsequent paragraphs and sentences must serve to support the thesis statement you have developed. The thesis statement serves many different purposes for the reader. First, it tells the reader how you'll be interpreting the subject matter throughout the remainder. The thesis statement also serves as a sort of "road map" to the reader that helps the reader understand what he/she should expect from the rest. Similarly, when writing the report in response to an inquiry, it clearly states what your thoughts are about that question. When completing a thesis statement, you need to try to keep it to just one sentence that will be included in your introductory paragraph. In this way, the rest of your document can be completed to organize the research you have gathered in a logical manner that supports the thesis you have written. In order to come up with your thesis, you need to have a clear idea about what your document will be about and what your position will be on the matter. If you're required to develop an opinion on the subject, this position should be conveyed in your thesis statement. Before you develop your thesis statement, you'll actually need to conduct an extensive amount of research on the topic first. This way, you can formulate your ideas and develop your position. 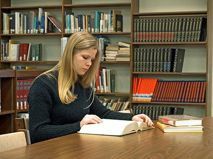 Although you may have an idea of what your thesis will be as you conduct your research, which is referred to as having a "working thesis," it will likely need to be tweaked and revised as you conduct your research further. Does the thesis answer the question? Does it take a position that could be challenged or opposed by someone else? Does it make a connection with the reader, or does it make the reader ask, "So what?" Can I write an essay that supports the thesis I have developed? Does it make the reader ask why or how? A strong thesis will answer a question while taking a stand that may be argued against. In addition, it should connect with the reader in some way. If your thesis makes the reader ask, "So what?," you'll need to rewrite the thesis statement. Similarly, there must be enough information available to adequately support your thesis. At the same time, if your thesis makes the reader ask how or why, it's probably too broad and should be narrowed accordingly. If writing the report for a class, it's always a good idea to run your thesis statement past the instructor. This way, you can gain feedback and find out if the thesis statement is strong and appropriate. the reactions of colonists to the English Crown's attitude towards New World inhabitants and culture. In this paper, the three-point thesis would be as follows: "The American Revolution arose in part from an emerging sense of separate national identity on the part of New World inhabitants. This identity can be seen by examining the ways in which distance from England allowed for the development of a separate culture among colonists, the ways in which English nationalism among colonists evolved over the course of the 18th century, and the reactions of colonists to the English Crown's attitude towards New World inhabitants." Three-point theses should be specific enough to allow for detailed exploration of each of the three components. For instance, the thesis above about the American Revolution would be a term-length paper or longer, because each of the three points would take several pages of development to adequately explain and defend. If the assignment is to complete a five-page essay regarding causes of the American Revolution, the scope should be significantly narrowed and the three points scaled down accordingly. A thesis for such a report might look like this: "New World colonists' distance from England allowed for the development of separate cultures among those colonistscultures that weren't as socially stratified, homogenous, or concerned with the traditions of European life as the culture of England. These cultural differences led in part to a sense of nationalism and independence that contributed to the American Revolution." When completing three-point theses, keep in mind that each point should be given roughly equal space and depth. If the three-point thesis were for a two-page essay, there would likely be a paragraph each for the introduction and conclusion, then about two developed paragraphs for each point. Three-point theses, like all theses, are essentially blueprints of a report or paper. Stick to the blueprint by following each point in the order in which it's presented in the thesis statement, and always remember to introduce the new point using a strong topic sentence. A thesis statement is an essential part of many academic works. It is most often a one-sentence statement that appears in the introductory paragraph of an academic paper, such as an essay or a reference project. Thesis statements explain the theme for a paper by succinctly stating the purpose and conclusion. There are several different ways to complete a thesis statement. The type of assignment that a student writes will generally determine the structure of the thesis statement. In most cases, a simple "if, then" assertion will be appropriate. In an "if, then" assertion, a student will state that if one thing happens, then a certain result will follow. "If, then" assertions are basic cause and effect statements, which help to provide structure and purpose. Some essays, however, require more complex thesis statements. For example, if a student is completing a comparative assignment, an "if, then" statement might not be appropriate. In such a situation where a student needs to compare multiple documents or ideas, he/she may wish to create a complex thesis statement that briefly explains the purpose and conclusion of the comparison paper. If a thesis statement can't be written in one sentence, it may be appropriate to break the thesis statement into two sentences, but only in some cases. Thesis statements are always included at or near the beginning. Some professors prefer that they're the first sentence of the introductory paragraph. Other professors prefer that a thesis statement is the last sentence of an introductory paragraph. Therefore, learners should always review writing guidelines that a professor hands out prior to creating the structure. Each body paragraph of a report should support the thesis statement. It often takes multiple ideas or pieces of information in order to prove a thesis statement to be true. Each new idea or piece of information should be included in a separate paragraph. The final paragraph of the paper should provide a conclusion by summarizing the ideas or pieces of information and drawing conclusions. The conclusion will always tie back to the thesis statement. A thesis statement is similar to a purpose statement. However, a formal purpose statement is a specific section of a scientific method or a reference project. A thesis is generally used with papers that explore ideas or provide information. A thesis does provide the purpose for an assignment, but a thesis statement isn't synonymous with a purpose statement, as a purpose statement refers to a scientific document. It is common for students new to college to receive criticism about their writing that focuses on the thesis statement, which is a sentence or group of sentences that asserts the main idea of any piece of writing. All academic works should have a thesis; frequently, however, students don't really know how to write a thesis statement. It is one of the most important skills that a college writer will acquire, enhancing not only his/her writing ability, but also his/her critical analysis and reading skills. Students learning how to write a thesis statement will benefit from first learning how to identify the thesis in others' work. Once a student is comfortable recognizing a thesis, he/she will better know how to write a thesis herself. To this end, it may be helpful for students to read a variety of student and professional texts to determine if they can identify the thesis statements of these documents. Typically, a thesis will be within the first 1/4 of the work and encapsulate in a few sentences the entire point of the piece. A good way to begin identifying thesis statements is to read a document and then write down in a sentence what the main idea of the entire document is. When going back to the first 1/4 of the document, some variation of that sentence should be clearly presented in the text. This is the thesis. Students may also find it helpful to look at writing composition books and online resources that underline or highlight thesis statements so that they can double-check their article-finding abilities. After students are comfortable recognizing a thesis statement, they can learn how to write theses themselves by imitating these theses. This doesn't mean that the student should copy the thesis of another writer, but that he/she should use other student compositions as models. For instance, a student may find the following thesis in an essay on the American Revolution: "The American Revolution arose in part from an emerging sense of separate national identity on the part of New World inhabitants. This identity can be seen by examining the ways in which distance from England allowed for the development of a separate culture among colonists." When examining this thesis in detail, the student may note that it is two fully-developed sentences. The first sentence clearly identifies the topic of the thesis and the following sentence presents evidence for the defense of that topic. The student may also notice that the thesis is written in very strong and specific languagethere is no question about exactly what the sentences mean, and no words that have vague connotations. In fact, the student may even notice that every single word contributes directly to the clear understanding of each sentence. After observing these elements, the student can model his/her own thesis on this form using an entirely different topic. Once a student has modeled a few theses, he/she will learn how to write theses without assistance. A thesis will always include an assertion of an opinion or interpretation and then reasons supporting the validity of that opinion or interpretation. Typically, the thesis will need to undergo several stages of revision until the student refines it to the clearest and most precise statement it can be. A thesis sentence is one that encapsulates a main argument or one component of a thesis statement. A thesis statementthe main point or argument of a textcan be of varying length and complexity. Therefore, it's not uncommon for a single thesis statement to be comprised of two or three main argument sentences. It is important not to confuse a thesis sentence with a thesis statement. Sometimes, a main argument contains only one thesis sentence. In this single sentence, the entire main point or primary argument of the text will be expressed. More often, however, this point or argument is broken into two and sometimes more sentences, particularly if the point or argument is detailed or complex. When the main argument is comprised of more than one sentence, it's common for the first sentence to be an assertion of the primary interpretation or argument of the report, and for the second thesis sentence to present evidence or examples that support that interpretation or argument. This second sentence can be thought of as the "how" sentence because it explains how the interpretation or argument will be defended and discussed in the course. Thesis statements must be very clear and precise; therefore, thesis sentences must be carefully crafted and even more carefully revised. A good practice for revising thesis sentences is to examine each word and phrase of the sentence and consider if that word or phrase is as precise as it can be. Consider the following thesis sentence: "Community service is a good thing for communities because it helps society improve." This has a basic idea, but it's not very specific. First, the word "good" is too vague. This writer should determine exactly what type of "good" community service does for communities. The same is true for the word "improve." This sentence should explain how society improves through community service. Another vague word is "society." Who or what comprises "society?" A better thesis on the same idea would be "Community service contributes to the social and cultural well-being of cities and towns by developing community relationships and addressing the particular needs of specific locales." All thesis sentences should be scrutinized in this fashion in order to develop thesis sentences that can't be misunderstood or misinterpreted. All college students must learn how to write a thesis, which is a statement or group of statements that expresses the main point or argument of a piece of writing. Every documentwhether it's a three-page essay or a multi-volume bookwill have a thesis. Learning how to write theses well is an essential skill for college writing. To write a thesis is to make an assertion, which is a bold statement of idea, opinion, or argument. It is confident and precise. Therefore, although to complete a thesis is to present one's own idea or opinion, it isn't the same as merely expressing oneself. Often, self-expression uses the first-person voice: "I think that..." or "My opinion is...." These aren't theses; they're only expressions of self. A thesis must transform that expression into an assertion that the writer presents as a true statement that can be logically defended. For example, if one were to complete a critical assertion on one's belief that Beethoven was a better composer than Mozart, one wouldn't say: "I think that Beethoven was a better composer than Mozart." This is self-expression. To make a thesis from this opinion requires the writer to cast this in assertive language, remove the first-person voice, and present justification for the opinion: "Though lacking Mozart's impressive productivity, Beethoven was a superior composer because his work demonstrates increasingly complex innovation over the course of his career." Notice that in this thesis, there's a phrase that explains why Beethoven was a superior composer. A thesis presents a point, and always gives justification for that point by saying why or how the point is valid. To write theses well, one must perform a process of multiple revisions. Revising the thesis requires carefully considering each word and phrase and determining if that word or phrase is assertive and precise. It also requires determining whether or not the claims the thesis makes are valid, defendable, and complex enough about which to write. One can't write theses on definitive facts such as "A foot consists of twelve inches," because there's nothing to say. Similarly, a thesis can't assert that "There are fourteen deities on Mars" because that thesis can't be defended using any valid scholarly document. Writing good theses takes time, but, like most skills, can be learned. Students will benefit greatly from seeking the assistance and feedback of their instructors or their university writing centers. These writing professionals can walk students through the process of constructing solid and compelling thesis statements. Thesis research is unlike the research a writer will do after the thesis has been determined in that thesis research isn't focused, but wandering; its purpose is to generate ideas rather than to find them. For many academic essays and papers, a thesis emerges from a period of brainstorming and exploring rather than from a eureka moment of inspiration. This is natural, as a thesis is a very refined, specific idea, and doesn't typically occur to a writer in its final form. The exploratory process of thesis generation often includes some research, particularly if the writer's topic is a complex or academic one. Why do thesis research? Often, a writer will be interested in a particular topic, but will not have enough information about that topic to develop a definitive point or opinion about it. In such cases, it's necessary to do some preliminary investigating in order to learn enough about the subject to develop a particular stance or opinion. In other cases, a writer may simply have a general area of interest, but no specific topic on which to develop an argument, and then may do some thesis research in order to determine possible topics on which to write. As mentioned, thesis research isn't the focused type of research a student will do after he/she has determined his/her thesis. Rather, thesis research is exploratory, and should be directed by a student's interest. For instance, if a student wishes to complete an essay on the relationship between left-handedness and musical talent, he/she would likely begin his/her research by browsing literature on handedness and talent. However, through the research, he/she may find himself/herself drawn in a new direction by a point made in that literature about a psychological aspect of musical talent, and decide he/she would prefer to write his/her assignment on that instead. Another difference between thesis research and essay or paper research is that thesis research is often internet-based, and this is fine. When completing academic texts, students are typically encouraged to base their research in sources found through scholarly databases; however, because thesis research is exploratory and is intended to generate ideas rather than serve as cited research, the internet is often an excellent source for this type of data collection. In fact, the type of web surfing that students commonly do when casually browsing the web is the exact type of exploratory research that a student should conduct when researching for a thesis. Students will have to write thesis statements as a normal part of their academic writing assignments. Every type of academic paper needs a thesis. Therefore, in order to effectively write theses for various types of reports, students need to understand the purpose. Whenever a student is required to write thesis statements, he/she should spend some time reflecting on the nature of the work before actually creating drafts. The whole purpose of a thesis statement is to briefly explain the point. If a report is especially long or research-loaded, the student might have a hard time narrowing down the point so that he/she can write theses statements. One of the best ways for students to write theses statements is to create a loose outline . Of course, a detailed outline can only be completed once a student knows what he/she wishes to say, which will be determined by the thesis statement. However, a loose outline will help the student to compose his/her thoughts so that he/she can understand what path he/she would like to take. The loose outline will also help the student to determine his/her conclusion . The conclusion is going to be a one- or two-paragraph statement about the student's findings. However, the thesis statement is a miniature, one-sentence conclusions will provides the purpose. Students should write thesis statements before they write the conclusion or the body. Yet, if the student already knows what the conclusion will be, he/she will have an easier time writing the thesis statement. When learners write theses statements, they usually follow a format. First, the thesis statement should appear as the first or last sentence of the introduction. Next, the thesis statement should follow an "if, then" format, which means that the student should state that if something happens in one way, then a result will occur in another way. When learners write thesis statements, they need to be aware that they aren't the same as introductions, even though the thesis statement is included in the introduction. Many times, students think that an entire introduction can replace a thesis statement. However, an introduction should provide background information and basic information about key themes. A thesis statement needs to clarify the author's purpose and should only be one sentence long. A thesis is the main point of an academic document. It can often be found in a statement or group of statements asserting an argument, claim, or idea that's the essential premise of the entire text. A thesis isn't the same as a topic, which is the general subject. For instance, there are reports written about marine biology, reports written about musicology, and papers completed about George Washington. All of these are topics. A hypothesis presents a point about that topic, typically incorporating a WHAT and a HOW. The WHAT is the paper's point or argument and the HOW is the way that point or argument is going to be explained and developed. Theses must be very specific. A hypothesis shouldn't state, for instance, that "George Washington was a good president." First, the word "good" is very vagueit could mean many different things. Second, this thesis doesn't give reasons explaining how Washington was a good president. A better hypothesis would develop the idea of "good" to be very specificfor instance, it might say that "George Washington's excellent negotiating and strategy skills regarding both domestic planning and foreign relations developed his reputation as a wise leader and a popular president." This thesis explains why Washington was a good presidentbecause he was an excellent negotiator and strategistand will explain how he was an excellent negotiator and strategist by pointing to his domestic planning success as well as his foreign relations skills. When composing theses, it's helpful to perform a process of multiple revisions in order to truly narrow the hypothesis down to a specific argument. This often begins by starting with general statements such as "George Washington was a good president." Like most aspects of writing, it's helpful to get basic ideas down first, and then to revise and refine. Revising the thesis requires carefully considering each word and phrase. It may help to constantly state to yourself, "George Washington was a good president because...." Then, reply with a variety of specific expansions of thought. For example, "George Washington was a good president because he helped to develop the nation and was an excellent negotiator." This is far more specific than "George Washington was a good president," but in this thesis statement, the phrases "helped to develop the nation" and "an excellent negotiator" aren't specific enough. Helped develop the nation how? Was good at negotiating in what way? Constantly asking these types of questions eventually leads to the final, specific thesis statement: "George Washington's excellent negotiating and strategy skills regarding both domestic planning and foreign relations developed his reputation as a wise leader and a popular president." Writing good theses takes this type of constant revision and investigation. However, once a solid hypothesis is discovered, the most difficult aspect of paper writing is over. The rest simply requires explaining and defending the ideas and arguments put forth in the thesis by sticking closely to the subject. When a student is working on a term paper or essay, one of his/her top priorities should be coming up with a good thesis statement. A good argument statement is one that states the purpose of the academic work without being too long or confusing. Good thesis statements can be difficult to construct, as they're one of the most important parts of an entire academic work and should be very specific. There are some tips that students can use when trying to make their own good thesis statements. The first thing that a student should think about, though, is the topic. The topic of the work will influence the thesis statement directly, as the thesis statement should directly relate to the topic. Therefore, the best way to create a good thesis statement is to perform the research on a topic first. Next, before students are able to form good thesis statements, they need to research the topic and form their own opinions. The research and opinions will both influence the purpose of the report and the direction that students plan to take the document. Students should write the thesis statement before writing the document. Some writers recommend writing the introduction after the entire paper has been completed. However, because the thesis statement is part of the introduction, it's important to distinguish between the two. The thesis statement provides the purpose. All paragraphs and information within the document should directly support the thesis statement. Therefore, it's essential that students have defined their thesis statements before they begin writing the document. A good argument statement will help learners to stick with the flow and the meaning of the overall report while they write. Many professors also recommend that students follow a certain format in order to write good thesis statements, especially younger writers. The simplest thesis statement format is an "if, then" format, in which a learner will state that if something happens one way, then there will be a corresponding result. This type of thesis statement is easy for many learners to write. The difference between a good thesis statement and a bad thesis statement is simple: good thesis statements are easy to support throughout the document. Bad thesis statements are usually harder to support. Therefore, a sign of a good paper is also that it supports that thesis statement. A bad paper often is bad because it veers away from the thesis statement. A good argument statement is the center of a college report. Many students find the word "thesis" at least somewhat confusing in the beginning of their college studies. Teachers will emphasize the importance of a thesis countless times, yet often students are left wondering what exactly a thesis is, and are therefore somewhat confused on how to make a thesis themselves. A thesis is simply a sentence or two asserting an individual's ideas, opinions, or analyses of a specific topic. To consider a thesis this way reveals that we all have many theses ready at our disposal simply from the opinions we hold. For instance, we may think that "Chicken is better roasted than baked" or "The city should hire more police offers to patrol the interstates" or "The political party I support is better equipped to run the country." The challenge for many college students, then, isn't how to make a thesis itself, but how to make a thesis that's appropriate. This isn't as difficult as it seems. Some students may be skeptical of how to make a thesis for a paper using some of the everyday opinions mentioned above. But really, it's quite simple. A thesis statement in a report should be a sentence or group of sentences that asserts the writer's ideas, opinions, or analyses regarding a certain topic, and should give an indication of how the writer is going to defend those ideas, opinions, or analyses in the course of his/her assignment. Solet's take the thesis that "I think chicken is better roasted than baked." Some may think this is an absurd topic on which to complete an essay, but it's nonetheless a thesis statement, and could very well be a thesis statement for a student studying culinary arts. To revise it and make it appropriate for writing on, first, the thesis needs to indicate how this opinion is going to be defended. This can easily be done by inserting a "because" at the end of the sentence and adding on some justifications: "I think chicken is better roasted than baked because roasted chickens retain tenderness while developing a crispy skin." Now, this thesis has a why that explains why the writer believes roasted chickens are better than baked. This has illustrated how to make a thesis appropriate for a paper simply by drawing on the student's own ideas. How to make theses better requires a little more finesse. A thesis doesn't have to be earth-shatteringly new; however, it should present the original ideas of the writer. Therefore, students wondering how to make theses better should simply look beneath the surface of their original thoughts and opinions and try to uncover the deeper nuances of their topic of interest. This may be difficult with the chicken thesis above, but not so much with the second thesis presented regarding increasing police patrols. Rather than simply writing a thesis such as "The city should hire more police offers to patrol the interstates because...", it would be much stronger to present an assertion that offers solutions. For instance: "If the city hired more police offers to patrol the interstates, the city could reduce the high accident mortality rate that's both financially costly and damaging to our city's families." This is a much more interesting thesis than "The city should hire more police offers to patrol the interstates because..." because this thesis asserts a strong, perhaps even controversial point-of-view. It holds within it a very complex idea. When wondering how to make an argument, learners should simply ask themselves what their opinions or ideas are regarding the topic of their documents, and then write these down. Next, they should revise these ideas in the way illustrated above. This is the process of how to make theses interesting, complex, and appropriate for college-level work. Every written work that's academically based, such as a term paper or essay, needs to have a thesis statement, which is usually a one- or two-sentence explanation of the purpose/goal and helps to define what the learner seeks to prove. One of the most popular questions that students have when it comes to writing their documents and essays has to do with how to write a thesis statement. The answer to questions about how to write a thesis statement is easy: follow a formula. Many professors recommend that all students begin the process of writing a thesis statement with a simple "if, then" formula in which a learner will state that if one thing happens in one way, then a result will occur in another way. When it comes to how to write thesis statements, the "if, then" formula is a sure-fire way for students to create an effective and simple statement. However, while the construction answer for how to write a thesis statement may be to use a formula, many learners may not understand the philosophical motivations behind thesis statements. Therefore, students need to know how to write thesis statements from a practical standpoint, as well as from the standpoint that thesis statements may be hard to create. One of the first things that students need to do if they're wondering how to write thesis statements is to consider the topic and purpose of their documents. The topic of the paper is the subject that the student has researched and decided to write about. The purpose of the report will be a result of the research. After a student spends time researching, he/she will have an idea about what he/she wants to prove or suggest to be true. The thesis statement is a one-sentence summary of this purpose. In effect, it is a mini-conclusion to the document. When students have questions about how to write a thesis statement, they're generally wondering how to construct an effective thesis statement and how to decide on a thesis statement. However, they aren't usually wondering how to structure their documents. Because the thesis statement is the backbone of an academic paper, students need to be aware that it should be created *before* the construction of the report, but only *after* the student has decided what the purpose of the paper is going to be. Therefore, the thesis statement provides the purpose/goal, but shouldn't dictate the format. Perhaps the most difficult part of completing a research paper for many college and university students is the thesis statement. Most students have no idea how to write a research paper thesis statement, the purpose of such a statement, and where their statement should appear. Clearing up the mystery surrounding research paper thesis statements is the key to helping students understand what goes into creating a good thesis statement which is ultimately the basis of a good reference project. Research paper thesis statements are what support a student's academic argument, which is what college-level writing is all about. Academic writing assignments are often intended to be forms of persuasive work. The student's job is to persuade the reader that his/her argument is sound, if not completely persuasive. A project that fails to present a persuasive argument backed by facts and research is a project that will likely receive a poor academic grade. The research paper thesis statement should appear in the introductory paragraph . Some students make the mistake of thinking that the thesis statement should appear in the conclusion and that it's a summation of what appears. On the contrary, a main argument is what supports the rest of the report, not what results from the document. A research paper thesis statement is essentially the stand that the writer intends to take. After a brief introduction of the topic, a student should state his/her position on the subject that the remainder of the work will support. The research paper thesis statement is often one short sentence. It doesn't have to be an entire paragraph. As a matter of fact, shorter, to-the-point, thesis statements are better than long, drawn out thesis statements. A thesis statement acts as the basis for the entire paper. The reason it appears at the beginning of the document is because the remainder of the text is used to support that one statement. Making a research paper thesis statement is like saying to someone "here is what I think," and then proceeding to support the position with sound, investigation-based arguments. Research paper thesis statements often make claims and assertions that may be unpopular. What students must do is to make sure that they fully support their thesis statement or their document will be weak. Rather than concentrating on a research paper thesis statement that's inflammatory, learners should be certain that their statement is one they can argue credibly. Thesis statements are one of the most common demands of academic studies at any level. This is because every writing assignment a student completes will require a thesis statement. Writing a thesis statement isn't easy; in fact, many learners will find that writing a thesis statement is the most difficult aspect of completing a paper or paper. For many learners, therefore, completing thesis statements effectively comes through regular and focused practice. A thesis statement is typically a sentence or group of sentences. Therefore, it's a very short text to compose. However, writing a thesis statement differs drastically from writing other sentences because in a thesis statement, every single word matters. A thesis statement summarizes the entire point of a report or essay; therefore, it must be explicitly clear, exceptionally well thought-through, and at least somewhat original. Therefore, these few sentences will likely take hours to generate and refine. The first step of writing a thesis statement is selecting a general topic. This topic should be something the student is interested in and has an opinion about. After choosing a general topic of interest, the student should consider if there's a more specific area of the topic that's interesting to him. Most student texts are brief; therefore the topic of the document shouldn't be larger than the space allotted for the assigned text. For instance, a student couldn't write about the topic "global warming" in the span of a single text: it's too large. Therefore, he/she should select one specific aspect of global warmingsuch as the contribution of household energy consumption to global warming. Next, the student must develop a thesis by inserting his/her opinion on or interpretation of the topic. For instance, in the previously mentioned topic regarding the contribution of household energy consumption to global warming, a student's opinion may be that "The contribution of household energy consumption to climate change is one of the most easily addressable ways of reducing global warming." This statement asserts an opinion. The statement above is a thesis statement, but it's not the best thesis statement possible. This is because it's not very specific. Completing thesis statements effectively requires re-examining the thesis several times to challenge it to be more original, more interesting, and more specific. For instance, in the statement above, there's no indication of why addressing household energy consumption is one of the easiest ways to reduce global warming. This writer should give an indication of that why in the thesis statement, so that it looks something like this: "Reducing household energy consumption is one of the most easily addressable ways of reducing global warming because household energy consumption can be reduced with very simple measures that are easy to implement." This is a much more specific thesis. Next, the student should consider vague words that could be replaced with more specific ones: for instance, "easily" could perhaps more accurately reflect the writer's idea if it were replaced with "efficiently." Completing thesis statements that are clear and precise requires this kind of careful revision. The revision process should be continued until the student has no further ideas of how to make the thesis statement more detailed. Then, the student should ask for feedback from his/her instructor or a classmate in order to determine if the thesis is as clear and specific to others as it's to him. If a student needs to complete an academic paper, he/she must include a thesis statement. All academic works (essays, research papers, term papers, etc.) need to have a thesis statement in the introductory paragraph. When students need to learn how to create a thesis statement, it often helps if they use a sample thesis statement as a basis. A sample thesis statement may help students to learn how to format and write a thesis statement because it will provide an example of what a thesis statement should look like and accomplish. Many students can easily model their own thesis statements around sample thesis statements as well by substituting their subject and thesis purpose where appropriate. There are many sources for sample thesis statements, including essays and other academic works that students may have submitted in the past to a professor for a grade. Students, therefore, may wish to ask their professors from some sample thesis statements that they can review. Professors may then direct the students to sample thesis statements that are actually effective and that the professor particularly likes. Students may also be able to find samples online by performing a search for thesis statements or by reviewing academic works that have been published online. If a student reviews works that have been published online, he/she may have a hard time determining which sentence in the first paragraph of the work is the sample thesis statement. Therefore, it often helps if the student has a professor or professional writer to turn to for assistance. Also, not all reports will have thesis statements, especially ones that were completed incorrectly. One of the best exercises that professors use when helping their students to learn how to write and identify thesis statements is to have them mimic an "if, then" thesis statement, in which the learner will review an "if, then" statement and then try to create one of his/her own. An "if, then" statement basically states that if something happens one way, then there will be a corresponding consequence. These are very popular thesis statement formats. Students also need to be aware that a sample thesis statement isn't the same as a sample thesis topic. In many cases where a student isn't familiar with writing, he/she may confuse a topic with a thesis statement. Paper topics define the intended subject matter. Thesis statements are one-sentence statements that fall within the first paragraph and are constructed based on research on the particular topic. What are considered the five most successful and five least successful multi-agency (federal, state, local government and civilian) disaster response collaborations where the lead agency was federal, particularly surrounding but not limited to cases of ground or drinking water contamination (including floods; toxic chemical spills; and the like) since 2005? By what criteria were the disaster mitigation responses evaluated and what similarities and differences do these evaluations reflect, that may be combined into a uniform disaster preparedness 'failure prevention' schema? 'Who or what to be studied' includes federal lead agencies in collaborative disaster response. 'Concepts and variables' will be performance evaluation criteria.